A bright, fresh, colourful dish of griddled peppers, red onion and courgette served with a herby dressing, and basil and mint leaves to finish. Delightful. Put the couscous into a small bowl, add a pinch each of salt and pepper and pour on the hot vegetable stock. Stir well, cover with cling film and set aside. For the herb dressing, put 200ml/7fl oz of water, the wine vinegar, garlic powder, dried herbs, sweetener and salt into a small pan and bring to a simmer. Take off the heat, whisk in the cornflour paste, then return to the heat and cook for 1–2 minutes, or until slightly thickened. Pour into a jug and leave to cool, then stir in the chopped parsley. Place all the veg in a large bowl and season with salt and pepper. Heat a large griddle pan over a high heat, then spray with about 20 sprays of oil. Lay about half the veg in the pan, being careful not to overcrowd it, and spray them with another 20 sprays of oil. Cook for 4–5 minutes on each side, until just softened and with some char lines, then remove to a plate. Repeat with the remaining veg. Cut the halloumi in half lengthways and then cut each half into 6 slices. Spray the griddle pan again with oil and lay the halloumi slices in the pan. Cook over a high heat for 6 minutes on each side. 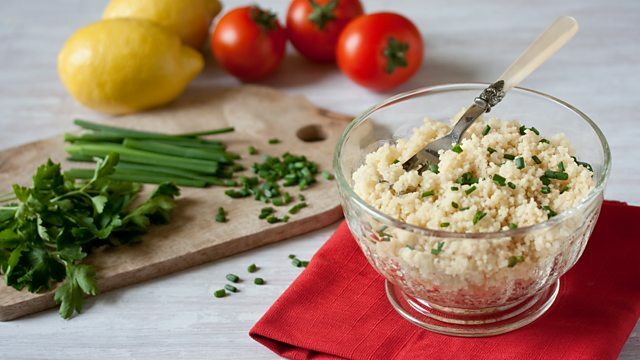 Fluff up the couscous with a fork and spoon it onto a large platter. 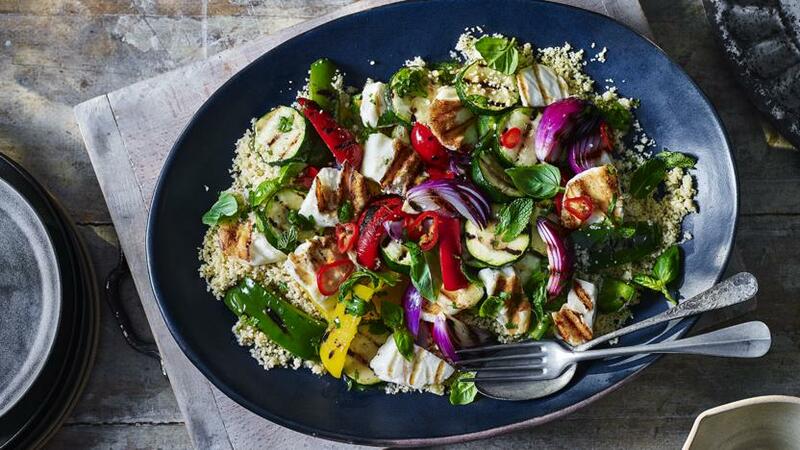 Top with the roasted veg and halloumi, then tear over the basil and mint leaves and scatter over the chilli, if using. Drizzle 6 tablespoons of the herb dressing over everything and serve.